The recently-released film and audio project documents the inspiration and live recording of a solo 23-minute composition that sees the multi-instrumentalist perform the song on seven instruments over the course of three days in the studio. Now, Grohl is using the project to raise funds to benefit several organizations that make it possible for young musicians to learn and grow. Starting Tuesday, October 9, fans can visit Reverb.com to bid on brand-new pieces of the gear that mirror the instruments Grohl used to make “Play”, donated by DW Drums, Fender, Gibson, Gretsch, Ludwig, Masters Of Maple, and Zildjian – and signed by the musician himself. 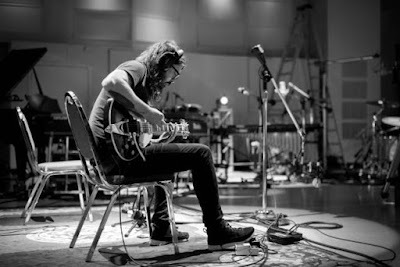 The auction will run from Tuesday, October 9 through Sunday evening, October 21; to preview the items that will be available in The Dave Grohl "Play" Reverb Auction, visit Reverb.com. Grohl has just released the limited-edition vinyl package for “Play"; the LP features a 180 gram, single-sided vinyl with the rocker’s studio floor plan that was used for the recording etched on the B-side. The intricate packaging is a reverse gatefold that opens up diagonally and includes an insert of the mic input list from the recording session. The Foo Fighters will wrap up an extensive North American tour in support of “Concrete And Gold” later this month.